Goaltender Ryan Kubic made 27 saves while James Malm (photo below) scored twice as the Vancouver Giants beat the Kamloops Blazers 3-1 at the Langley Events Centre. It didn’t show up on the score sheet, but Jack Flaman earned a huge assist. With the Vancouver Giants ahead 2-1 in the second period, teammate James Malm skated by the bench in need of a new stick after breaking his earlier in the shift. Malm grabbed the first one offered to him as he skated by the bench and it happened to be Flaman’s. Defenceman Marcus Kichton’s clearing attempt found Malm in the neutral zone and as the forward skated down the wing, he was thinking shot all the way, figuring using an unfamiliar stick, a pass might be risky. “It was a bit longer than I normally use, but it worked,” a smiling Malm said afterwards, claiming Flaman — who is tied for the team lead with three goals — wanted credit for the goal. The goal gave the Giants a 3-1 lead, one they would not relinquish as they picked up their first Western Hockey League victory of the season, defeating the Kamloops Broncos by that 3-1 score, improving to 1-4-0-0. The Blazers — playing their third game in as many days — fell to 2-3-0-0. 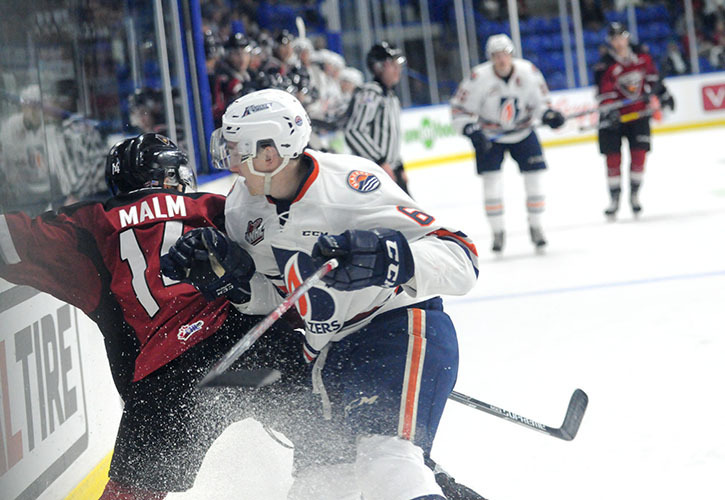 Malm had also scored in the first period, his first career WHL goal after 30 games spanning last season and the 2016/17 campaign. On his first goal, Malm drove hard to the net and was in perfect position to tap home Alec Baer’s rebound on a 2-on-1 break. The goal came less than two minutes after Brendan Semchuk had opened the scoring, taking a pass from Dawson Holt, who was behind the net, gaining control of the puck and wiring it home 7:20 into the game. The goal came at an opportune time as after Vancouver went ahead 2-0, the Blazers called timeout and then controlled play for the rest of the first period and then the first half of the second stanza. Kamloops also got on the board, as defenceman Luke Zazula — a WHL rookie playing in his hometown — beat a screened Ryan Kubic with a wrist shot from the blue-line at 6:03. It would be the lone puck to elude Kubic, who was sharp in goal, finishing with 27 saves as Kamloops out-shot Vancouver 28-25. “We were just sacrificing the body, blocking a lot more shots,” Kubic said. The Giants number one goaltender made his fourth start of the season after backing up in Friday’s game, a 4-2 loss to Seattle. “We played a much more structured game and our commitment level to winning the game was where it needed to be,” said Giants coach Jason McKee, adding that while there are still areas to improve, there were also lots of positives to build on. In the season’s first three games, Vancouver has been out-played in the opening period but this marked the second straight contest they have scored first. “The kids have been working at it. They see themselves getting better and tonight to get rewarded with a win is the best thing we can ask for,” McKee said. The Giants are back in action on Oct. 5 when they host the Victoria Royals at the LEC with a 7 p.m. puck drop. Malm, Kubic and Radovan Bondra were the game’s three stars.